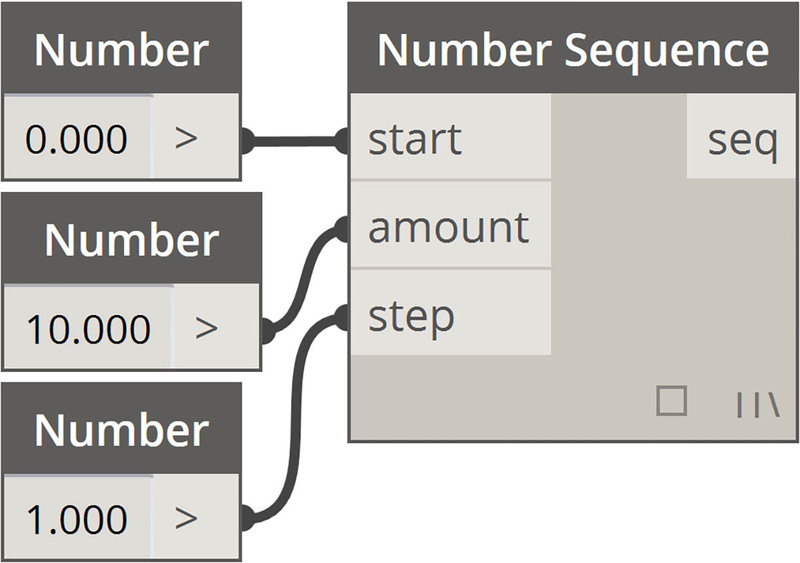 There are a few basic shorthand methods in the code block which, simply put, make data management a lot easier. We&apos;ll break down the basics below and discuss how this shorthand can be used both for creating and querying data. Notice that the syntax 0..10..1; is equivalent to 0..10;. 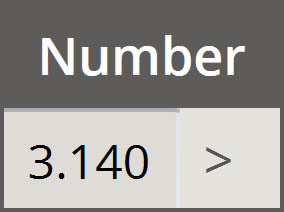 A step-size of 1 is the default value for the shorthand notation. So 0..10; will give a sequence from 0 to 10 with a step-size of 1. 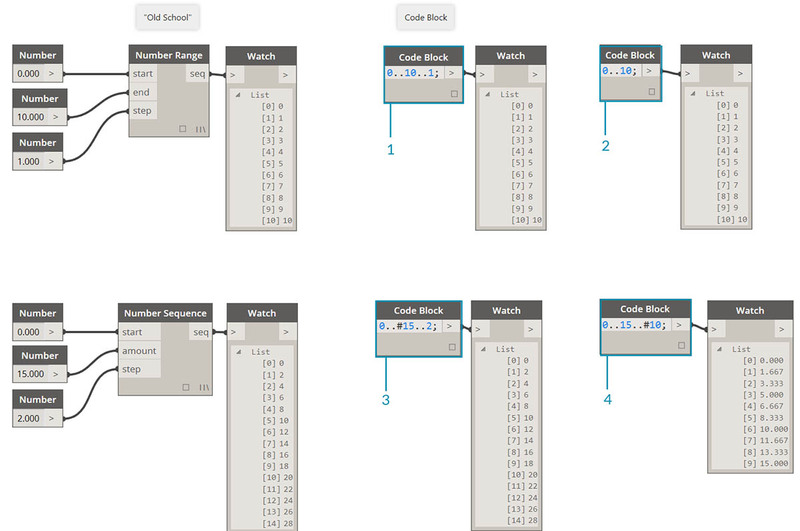 Creating advanced ranges allows us to work with list of lists in a simple fashion. In the examples below, we&apos;re isolating a variable from the primary range notation, and creating another range of that list. Creating nested ranges, compare the notation with a "#" vs. the notation without. The same logic applies as in basic ranges, except it gets a little more complex. We can define a sub-range at any place within the primary range, and notice that we can have two sub-ranges as well. By controlling the "end" value in a range, we create more ranges of differing lengths. As a logic exercise, compare the two shorthands above and try to parse through how subranges and the "#" notation drive the resultant output. 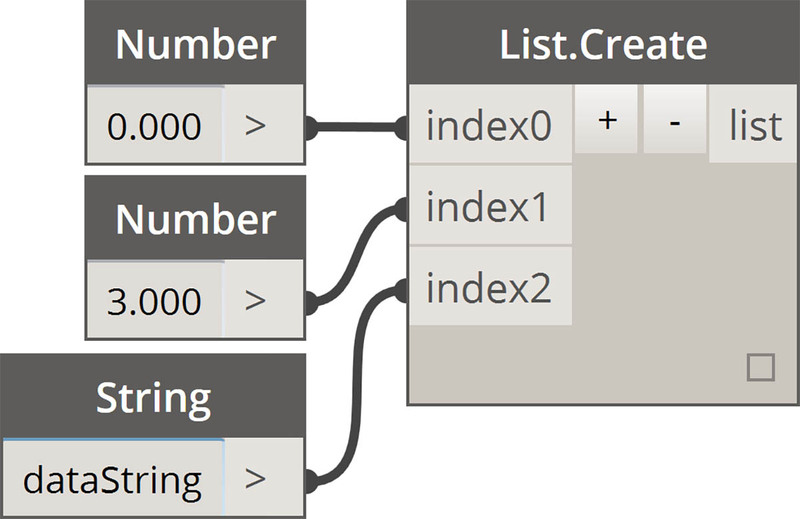 Create lists quickly with strings and query them using the item index. Create lists with variables and query using the range shorthand notation. Define a list of lists. Query a list with single bracket notation. Query an item with double bracket notation. In this exercise, we will flex our new shorthand skills to create a funky-cool eggshell surface defined by ranges and formulas. 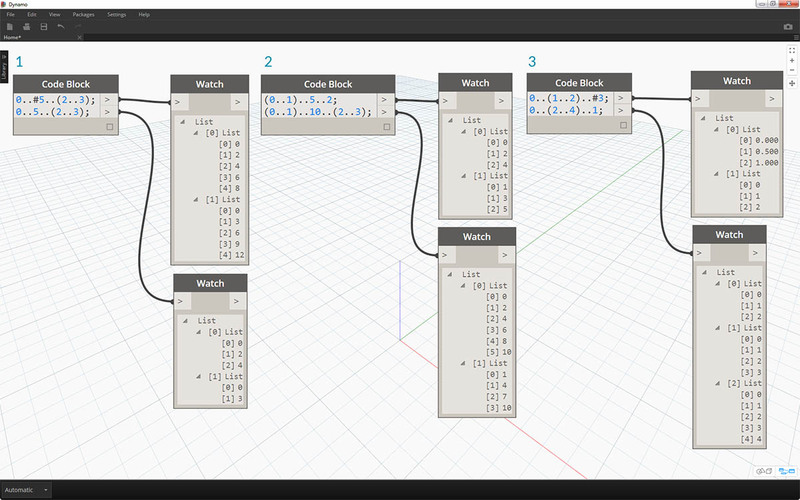 During this exercise, notice how we use code block and existing Dynamo nodes in tandem: we use the code block for the heavy data lifting while the Dynamo nodes are visually laid out for legibility of the definition. 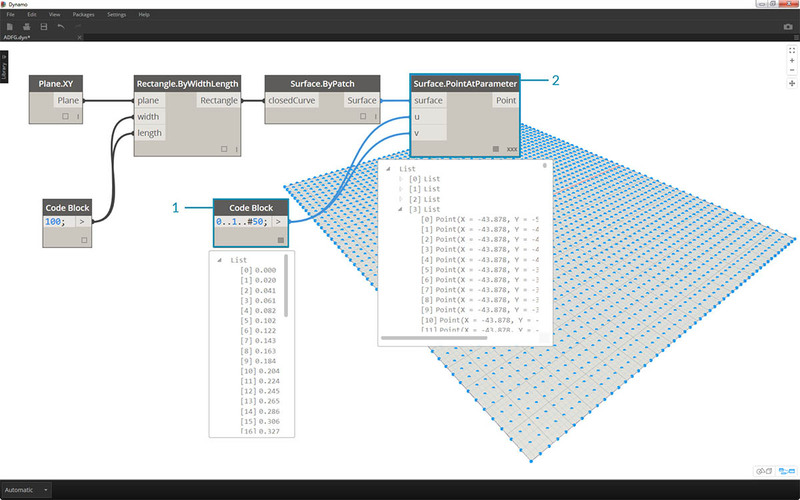 Start by creating a surface by connecting the nodes above. 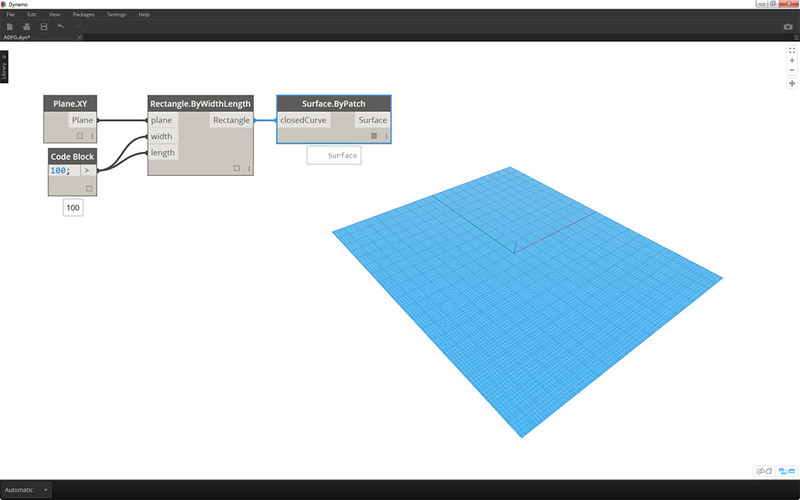 Instead of using a number node to define width and length, double click on the canvas and type 100; into a code block. Define a range between 0 and 1 with 50 divisions by typing 0..1..#50 into a code block. 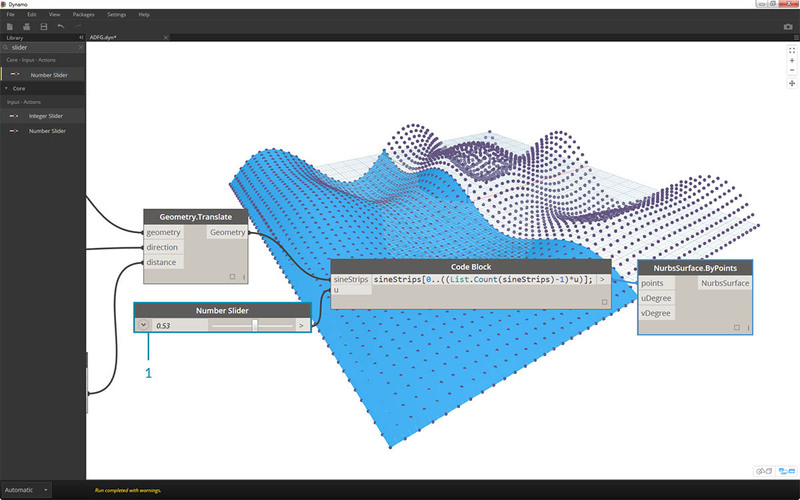 Connect the range into Surface.PointAtParameter, which takes u and v values between 0 and 1 across the surface. 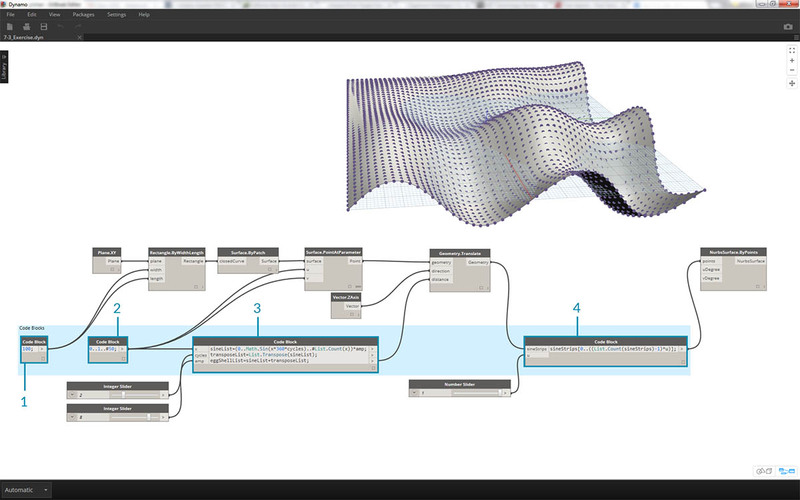 Remember to change the Lacing to Cross Product by right clicking on the Surface.PointAtParameter node. In this step, we employ our first function to move the grid of points up in the Z. 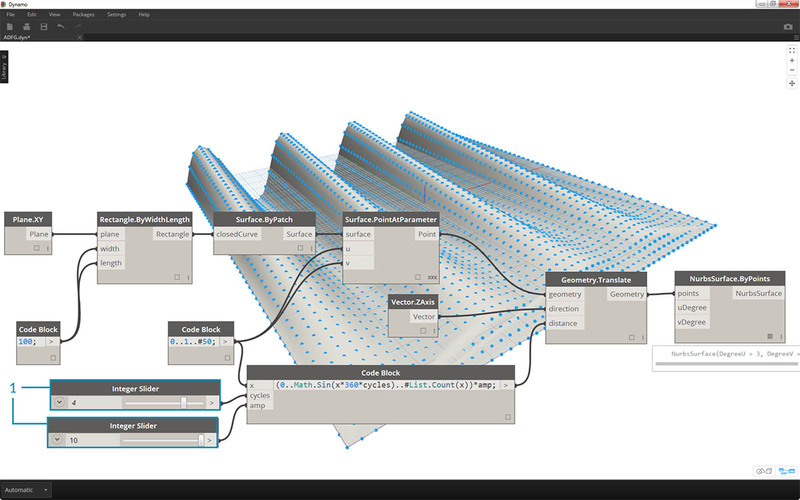 This grid will drive a generated surface based on the underlying function. Add the visual nodes to the canvas as shown in the image above. 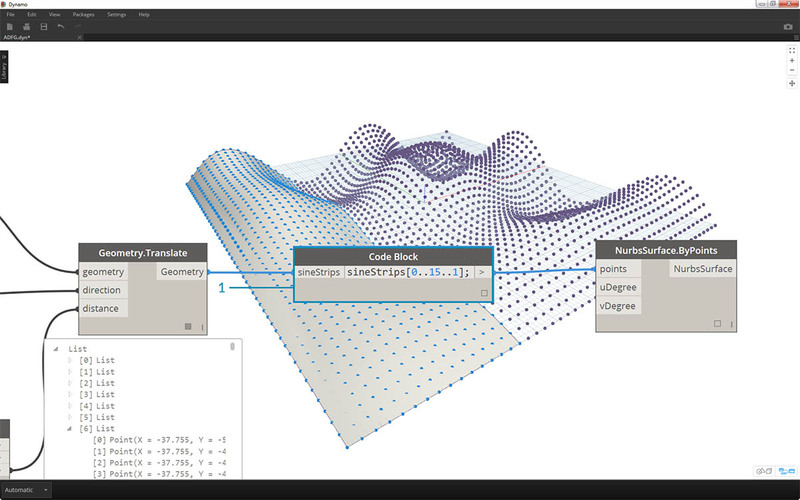 Rather than using a formula node, we use a code block with the line: (0..Math.Sin(x*360)..#50)*5;. To quickly break this down, we&apos;re defining a range with a formula inside of it. This formula is the Sine function. The sine function receives degree inputs in Dynamo, so in order to get a full sine wave, we multiple our x values (this is the range input from 0 to 1) by 360. Next we want the same number of divisions as control grid points for each row, so we define fifty subdivisions with #50. 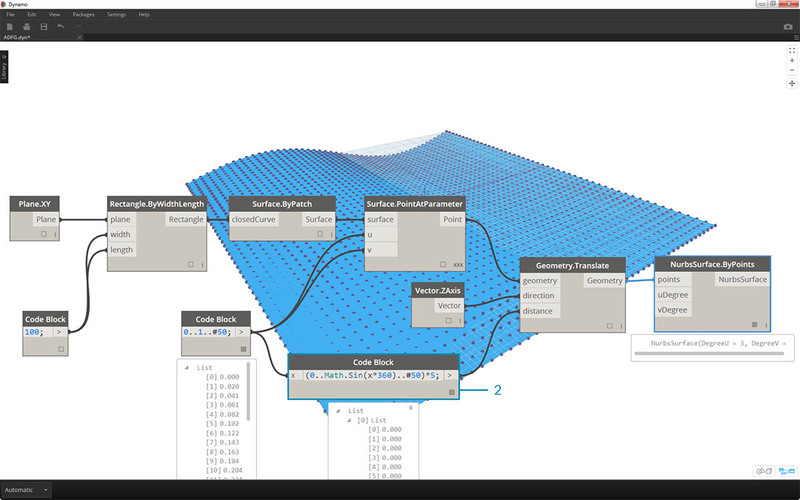 Finally, the multiplier of 5 simply increases the amplitude of translation so that we can see the effect in the Dynamo Preview. 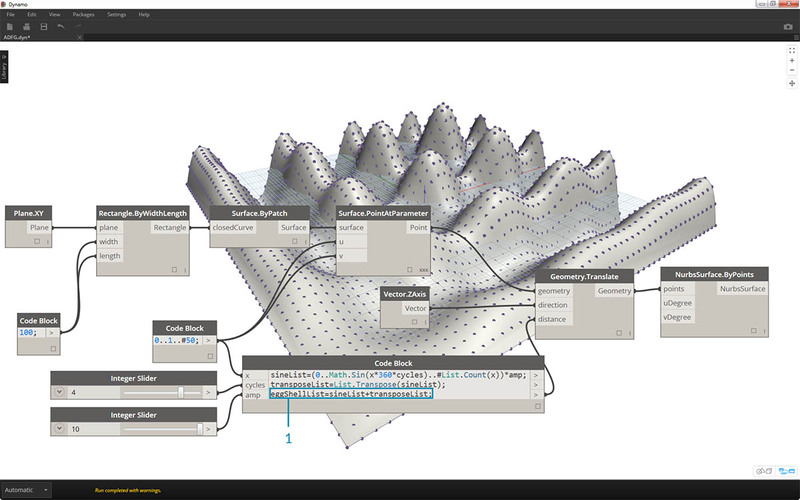 While the previous code block worked fine, it wasn&apos;t completely parametric. 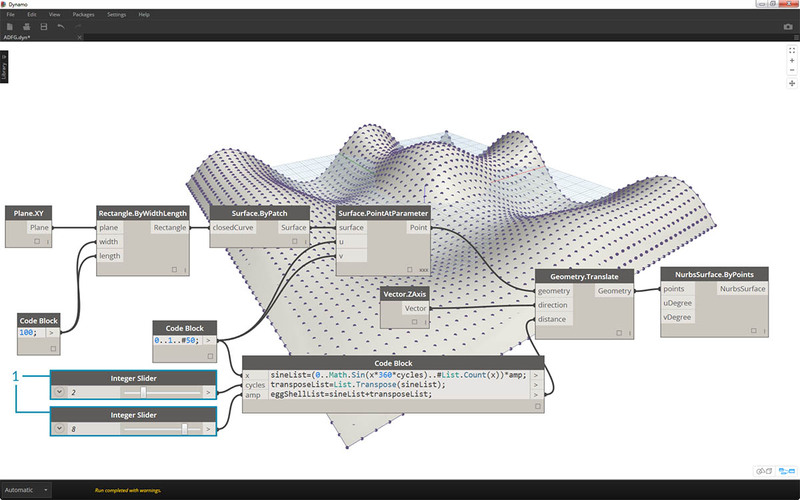 We want to dynamically drive its parameters, so we&apos;ll replace the line from the previous step with (0..Math.Sin(x*360*cycles)..#List.Count(x))*amp;. This gives us the ability to define these values based on inputs. By changing the sliders (ranging from 0 to 10), we get some interesting results. Changing the sliders again let&apos;s us calm the waters of this algorithm. 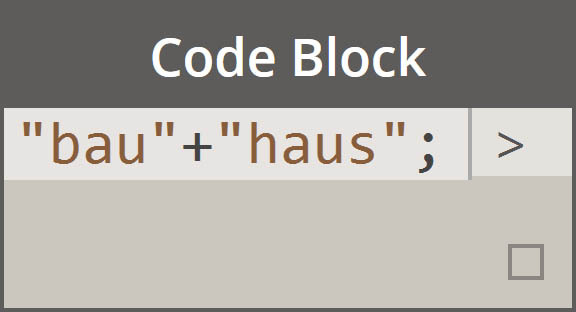 Last, let&apos;s query isolated parts of the data with the code block. 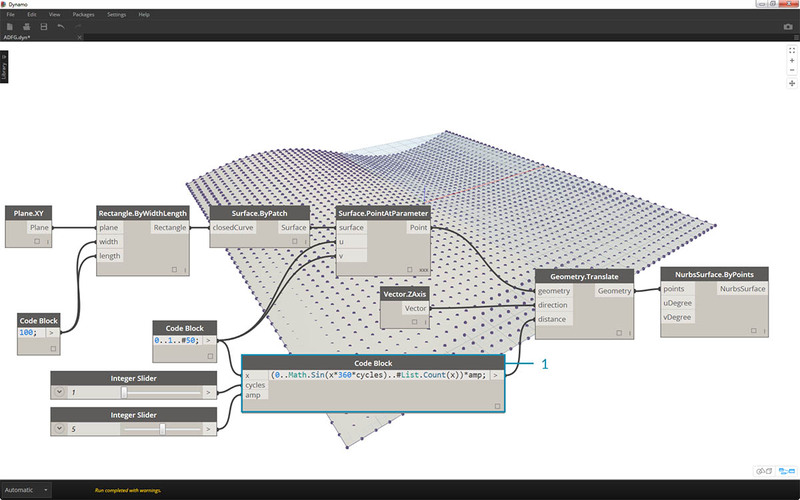 To regenerate the surface with a specific range of points, add the code block above between the Geometry.Translate and NurbsSurface.ByPoints node. This has the line of text: sineStrips[0..15..1];. This will select the first 16 rows of points (out of 50). Recreating the surface, we can see that we&apos;ve generated an isolated portion of the grid of points. 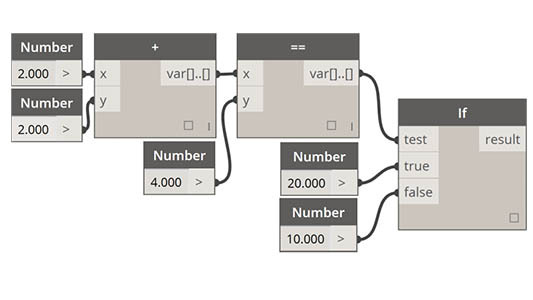 In the final step, to make this code block more parametric, we drive the query by using a slider ranging from 0 to 1. 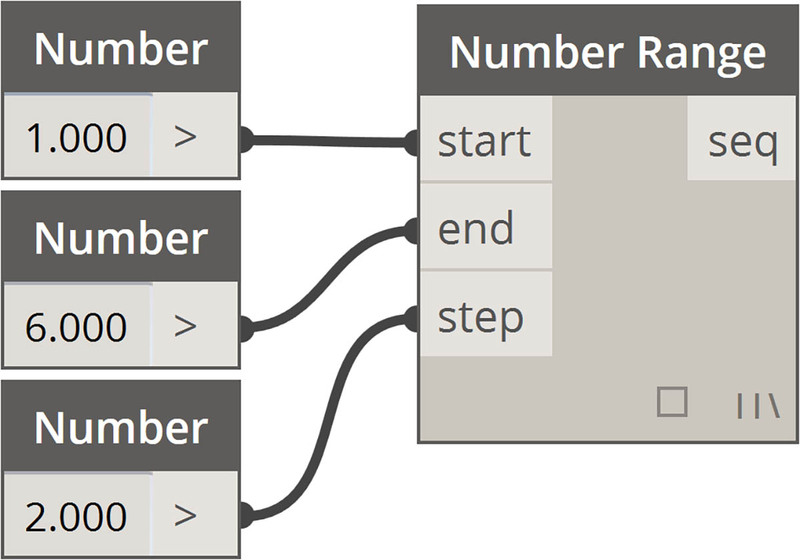 We do this with this line of code: sineStrips[0..((List.Count(sineStrips)-1)*u)];. This may seem confusing, but the line of code gives us a quick way to scale the length of the list into a multiplier between 0 and 1. 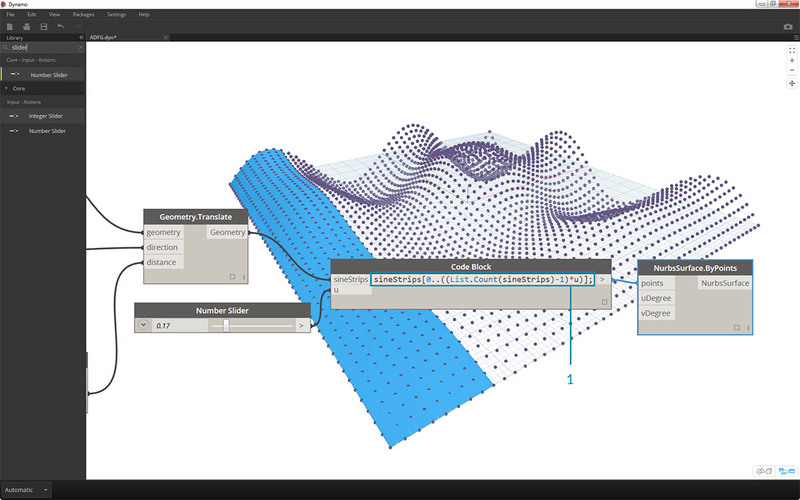 A value of .53 on the slider creates a surface just past the midpoint of the grid. 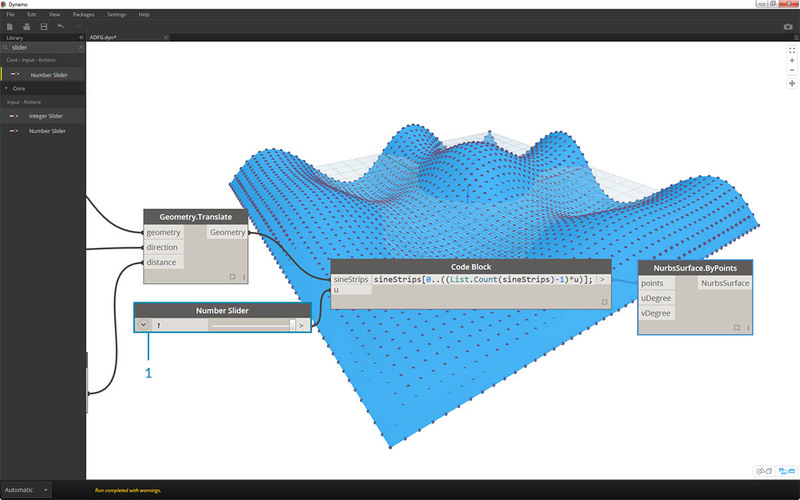 And as expected, a slider of 1 creates a surface from the full grid of points. 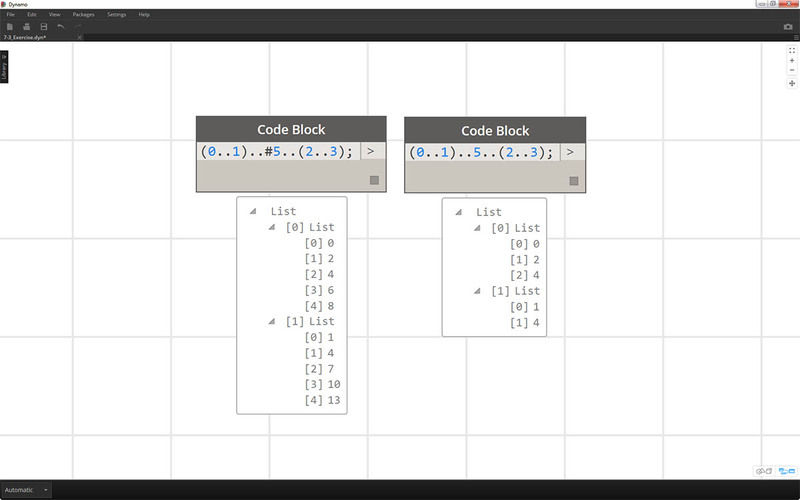 Looking at the resultant visual graph, we can highlight the code blocks and see each of their functions. 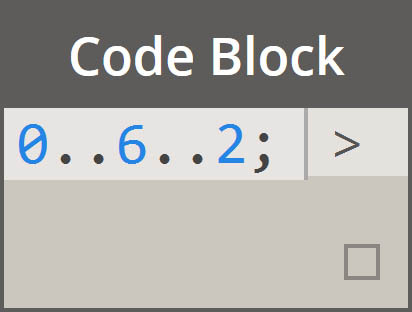 The first code block replaces the Number node. 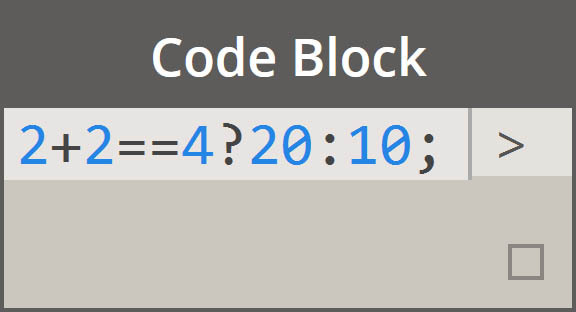 The second code block replaces the Number Range node. 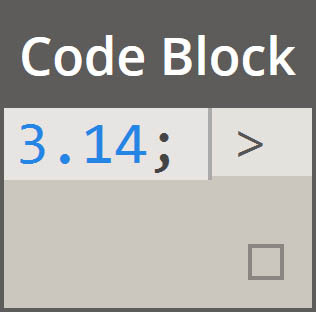 The third code block replaces the Formula node (as well as List.Transpose, List.Count and Number Range). 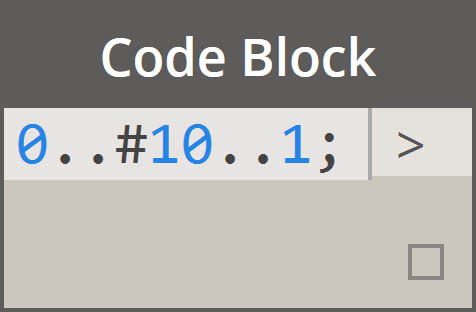 The fourth code block queries a list of lists, replacing the List.GetItemAtIndex node.